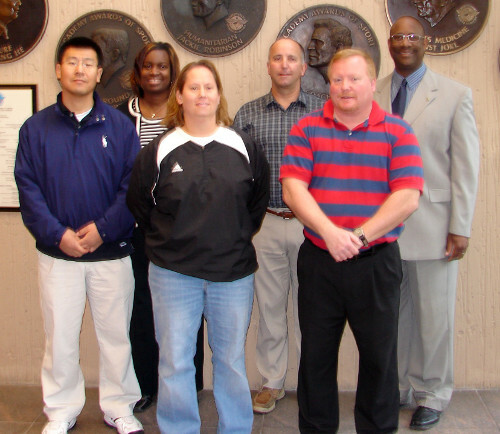 Six doctoral students at the United States Sports Academy completed their comprehensive final examinations on the Academy’s campus on 10-12 November. Standing in the lobby are (front row, left to right) Sichan Park of South Korea; Melissa Thomas of Saraland, Ala.; Mark Streiff of Evans Mill, N.Y.; (back row) Kristene Kelly of Raleigh, N.C.; .William Nowlan of East Longmeadow, Mass. ; and Dr. Fred Cromartie, Dean of Academic Affairs for the Academy. Not pictured is John Starr of Lyverly, Ga.